It has been awhile since I’ve checked in on the books portion of this site. That’s because I took a break from reading new (to me at least) books in favor of revisiting the six books of Frank Herbert’s Dune Series. This is something I do about every year or so, whenever the mood strikes me. Rereading these is always an enjoyable experience since it is an interesting mix of revisiting old friends and finding new perspectives and ideas within familiar settings and finding new ways they apply to the time in which I am reading the books. The series has been reviewed so many times before that I don’t feel like I can say anything novel at this point. Obviously, I love the books, but more importantly I love how different passages stay with me at different times depending on what’s going on in my life and the world. With this in mind, I just wanted to share some of the quotes and ideas that really stood out for me during this reading. So sit back, grab a spice beer, and enjoy my collection of largely spoiler free quotations from the series. Some awesome person even set this to an old Calvin & Hobbes cartoon on their Tumlbr page. I don’t know this person, and I hope they don’t mind the link; I just think their idea is fantastic. I find myself thinking of this one most frequently at work when dealing with someone who is particularly difficult or demanding. As someone who often finds himself relying on machines to do a lot of thinking for him and has occasional problems focusing on the present situation, I like keeping this in mind from time to time. Doesn’t always help me, of course, but I usually find the idea relevant. I think anyone who has ever been at least partially awake while working an office job can appreciate this one. This is more whimsical quote that happens to occur just before a very important scene in the early part of the series. Paul Muad’dib has taken custody of Bijaz (who was a ton of great lines in his short amount of page time) who speaks entirely in nimble riddles and word tricks. Bijaz’s weapons are his words and Paul is quick to realize that the dwarf is far more than he appears. This particular quote is a great representation of the character and was the particular one that stood out. This excerpt from Princess Irulan appropriately heads a chapter in which Farad’n Corrino is being indoctrinated into Bene Gesserit thought. I like how it touches upon the ways in which language can be used to subjugate and control certain groups or people. I chose this passage because despite being among the easiest to pull out into a single quote, it also is both interesting and extremely relevant as the story transitions into the later books. For the real world, it raises questions about how language influences and prejudices how we experience ideas and reality. For the books, it shows part of the God Emperor’s shaping of humanity to question reality and the universe around them, and primes them to explode outside the boundaries of the known universe. The series also has no shortage of quotable thoughts on politics as well, and, seeing how an election cycle is ramping up, I can’t help but think about how some of these apply. As the number of candidates and corporate money pouring into the elections machine climbs steadily higher. Until next time, cheers and Long live the fighters of Muad’dib! One of the goodies that made it home with me from my recent trip out of state was a lone bottle of something I’d been curious to try for awhile. 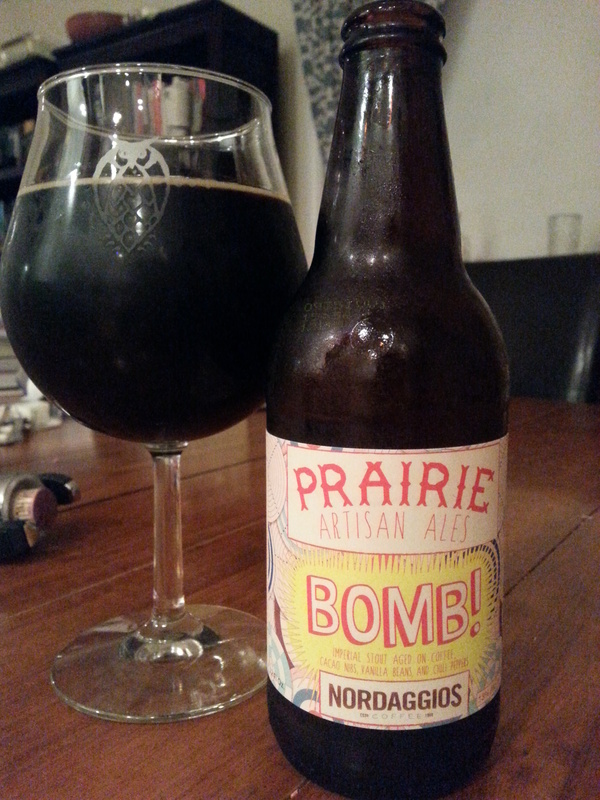 As promised here is my review of Prairie Bomb! Pour Info: Poured from a refrigerated 12 oz. bottle into a snifter glass. Price: $9.99 for a 12 oz. bottle. A bit steep for a random pickup, but my love of stouts and the beer’s rock solid reputation convinced me to pick up this highly sought after beer I won’t see in my home market. Appearance: As expected, a thick black pour topped off by a thin tan head. Smell:.Lots of light, roasty coffee dominate the smell. A little bit of pepper snuck through on the finish at warmer temperatures. Taste: The front end of the beer is some more of that roasted coffee mixed in with some bittersweet chocolate. The ending of the beer is where you get hints of chilli peppers; just a little bit of an extra bite mixing with the roastiness. Somewhere in the middle is subdued vanilla in the background that bridges the two ends of the beer. As the beer sits for a bit and warms up, the chilli peppers come out a bit more and the coffee fades off a bit. The peppers pick up to a point that the beer does get a slight spice at the end. As for alcohol heat, there surprisingly isn’t that much of it. I think there’s probably too many other tastes going on for it to really come through. Mouth Feel: Not to be nitpicky, but it was more of a medium thickness. It wasn’t really a flaw, and perhaps it was necessary to get through a monster beer like this; however, I was expecting more body. Hype Factor: Sky high. There’s a lot of buzz around this beer, and it has received just about the highest possible scores on the big rating sites. Adding in that it was a chance find and fairly significant purchase, I was really looking forward to this one. Overall: This is certainly a very, very good beer, and I certainly can see why it gets the attention it does. There are a lot of complex tastes going on in here. The blending of flavors was spot on. I really appreciated how the different tastes were able to stand on their own without clashing. I also liked how this was a chilli beer that didn’t go the route of having to be overly spicy (something that I have yet to see turn out well). I am, however, at a bit of a loss as to how to categorize this now. As a chilli stout, this is hands down the best I’ve ever had. As a coffee and/or vanilla stout, it is also a superior brew, but is perhaps edged out by some of the other “World Class” rated options. Evaluated solely by its own standards this is an excellent beer. It has a lot to offer and is worth seeking out and trying. This time we’re looking at a local offering that I couldn’t help but pick up off the shelf at Kappy’s. I haven’t had nearly enough of this brewery in my drinking rotation, so perhaps now is the time to fix that. 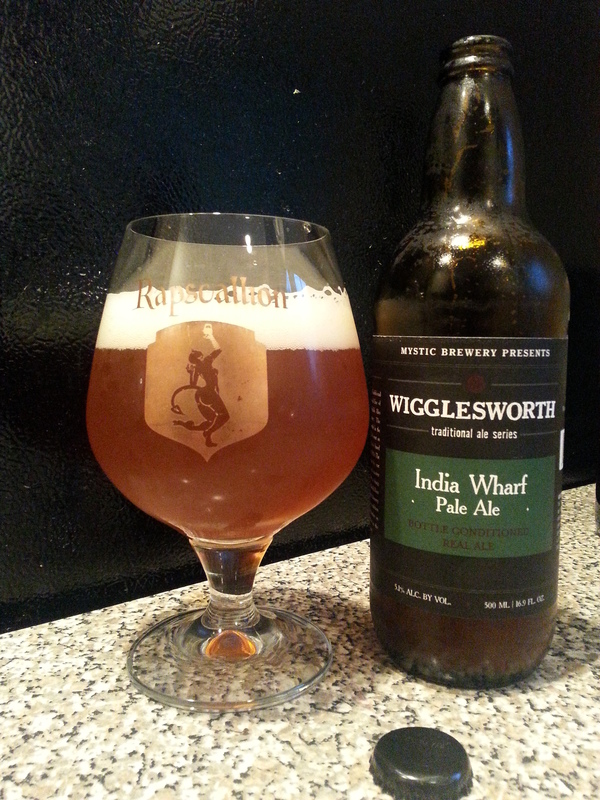 Description: Part of the brewery’s Wigglesworth series of bottle conditioned real ales. Pour Info: Poured from a refrigerated 500 ml (16.9 oz.) bottle into a snifter glass. Couldn’t find a bottled on date. Price: I don’t remember exactly since it was lumped in with other purchases, but I believe it was in the $3-4 price range. Appearance: There was a nice hazy mist upon opening the bottle, noticeably more so than usual upon opening up a bottle (as odd as that sounds). Characteristic golden body with a lively fluffy white that didn’t quite disappear entirely. Smell:.Not much going on here. There was a burst of resiny bitterness upon opening the bottle but not so much in the glass, where there was just a hint of floral bitterness. Taste: The taste really brought what the nose hints at. Lots of bitterness of the floral variety in this beer. The beer got a little sweeter at warmer temperatures, but this was first and foremost a very crisp, dry tasting hoppy beer. Mouth Feel: Appropriately medium bodied for the style. It was playfully bubbly without being over carbonated. Hype Factor: Cautiously optimistic. Mystic is a somewhat under the radar but very well regarded local that I haven’t had a lot of experience with. Overall: This was a very solid beer. The word “quality” comes to mind in describing the taste and execution; you can really taste that this was well made. The taste profile is not quite in line with my usual IPA preferences, but I cannot deny that this is a top notch brew. I’m happy I picked it up and would try it on draft if given the chance. I’ll even recommend someone else do the same. Following a period of technical difficulties, I am back ready to make up for lost posting time. And it only seems fitting to jump back into things by taking a trip over to Night Shift, where they are welcoming in the warmer weather by expanding their seating outdoors. Let’s see what beers they have to welcome me back. Starting off with the Barrel Society offering (and proof that I really am still reading books), on tap for my visit was Hogarth. This is the second of this year’s society beers and was released on May 28. This beer is described as a Strong Ale that has been aged in apple brandy and bourbon barrels. 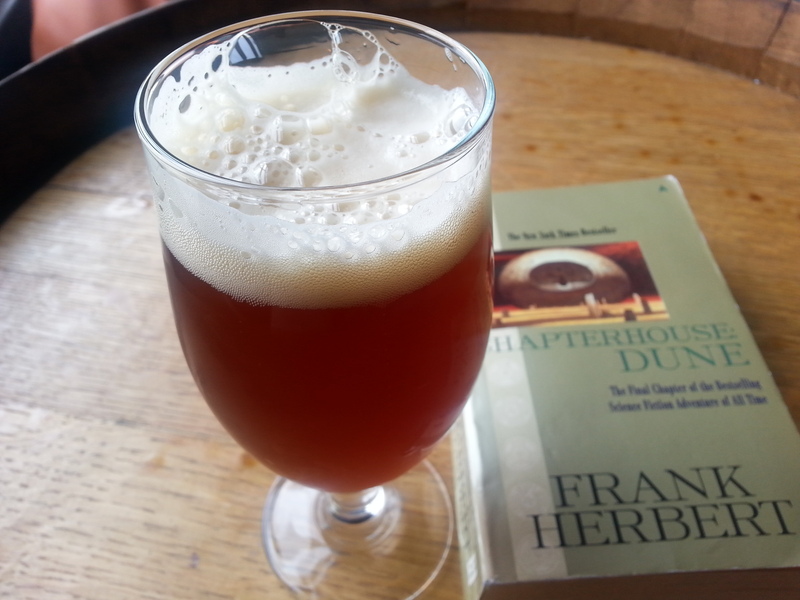 It pours a rich caramel colored body with thick, foamy off-white head. The smell offered some hints of the beer’s origins; slightly sweet with some hints of oak and brandy. The taste is also on the sweet side with a little bit of bourbon heat and a nice smooth maltiness. The influence of the apple brandy barrels comes through more after the beer has sat for a few minutes. There is a little bit of a funky bitter taste that lingers after beer finishes that, while not unwelcome, perhaps seems a bit out of place. The mouthfeel is also a bit thinner than I might have expected though it is still medium-plus. Overall, I think it was a pretty good beer but not one of my favorite Barrel Society offerings. For what it’s worth, the releases last year really started coming on strong at the third beer, so I’m eagerly awaiting what comes next. I’m also curious to see how this one ages, so I’m going to sit on a bottle for awhile and see how it goes. 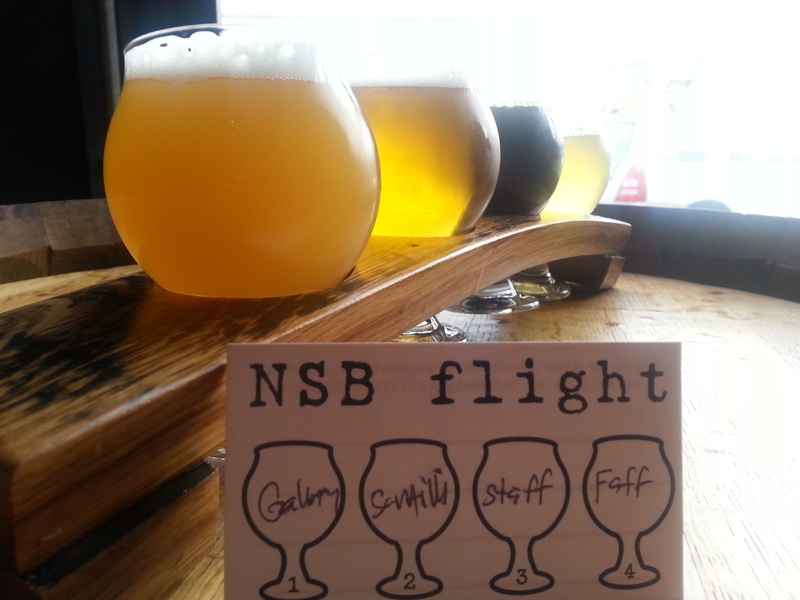 My latest flight was a mix of styles. This time out I had (listed in the order pictured) a Pale Ale, an IPA, a Porter, and a Pilsner. The Pale Ale was the latest installment in the brewery’s new One Hop This Time series, this time featuring Galaxy Hops. This was a very good beer, clean tasting with a very nice light juicy and citrusy bitterness. Next up was Santilli, a beer that has recently become the brewery’s flagship IPA and one of the select few offerings to see distribution in bottles. It is definitely a solid beer, slightly darker than the Pale Ale and noticeably hoppier. It is also maltier with a yeasty/bready backbone and a slightly sweet finish. From here I went out of order and grabbed the Pilsner, named Pfaffenheck, next. This beer was well executed but at the same time wasn’t quite my thing. It certainly accomplished what they were looking to do; the beer was clean, crisp, and a little bit wheaty. I think what did this in for me was a little bit of sweetness and what I picked up as a slightly peppery herbal finish. Rounding out the flight was Stafford, the Porter. This was another very nice beer continuing Night Shift’s run of solid Porters this year. It offered some good roasted espresso notes on top of a smooth, thick, and creamy base. Well done.